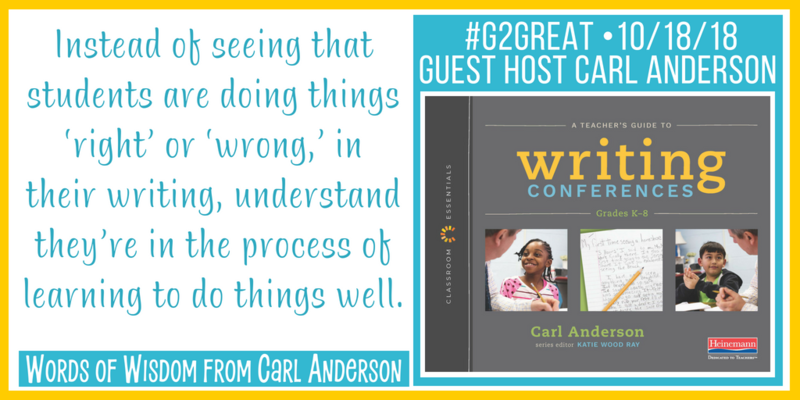 Carl Anderson, joined #G2Great this week and true to form the conversation was positively brilliant! 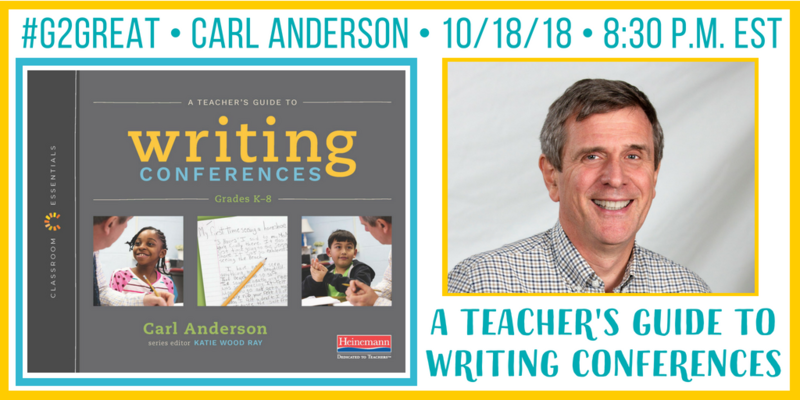 From the first time I started to make the pilgrimage to Teacher’s College, Carl Anderson, was always one of my “have to see” presenters. 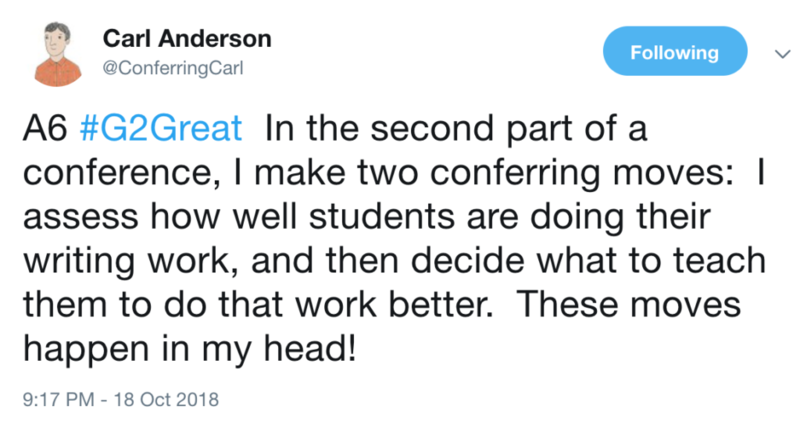 He has this amazing way of speaking that makes me want to lean in and listen closely with both ears. 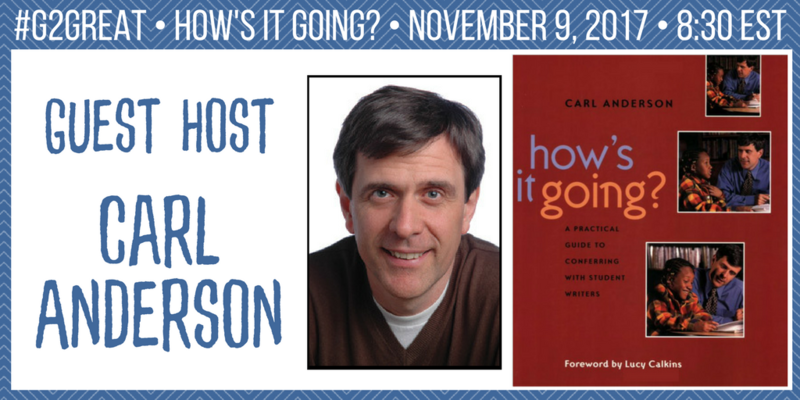 He blends his extensive knowledge for conferring, personal reflection, and story until his words come out like honey. Golden and sweet and it just makes my teacher soul feel… at home. 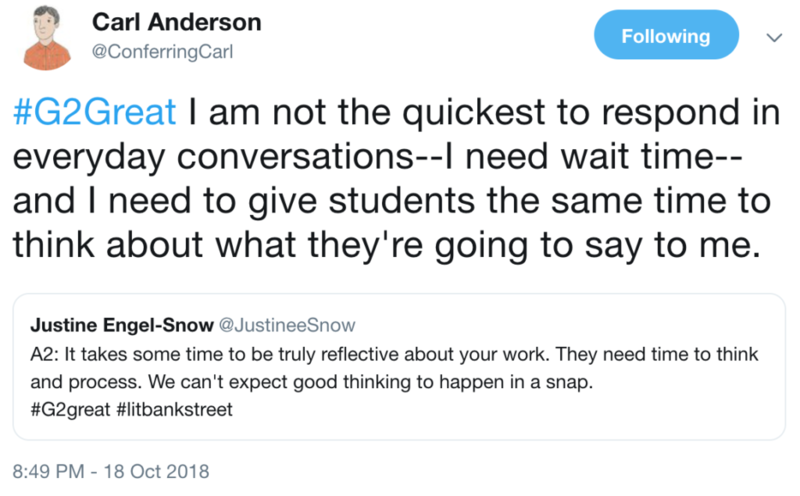 As I listen to Carl, because in my mind we are good friends, I know that my work with students, the work that matters the most, stems from is just knowing how to listen and to be responsive. 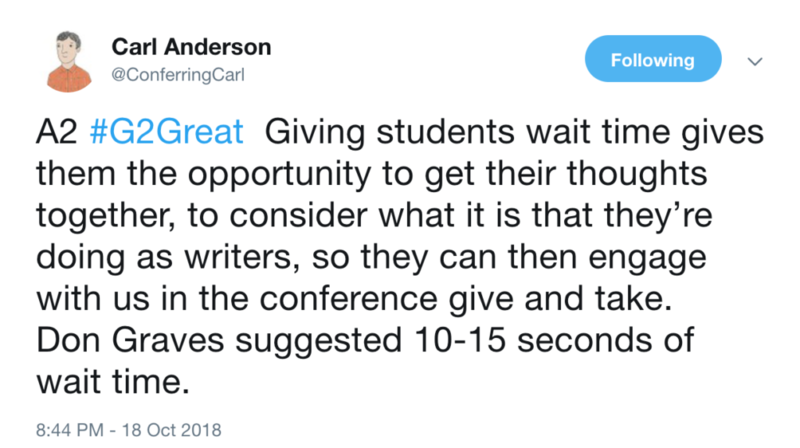 To me, a writing conference suggests all that is good in school. 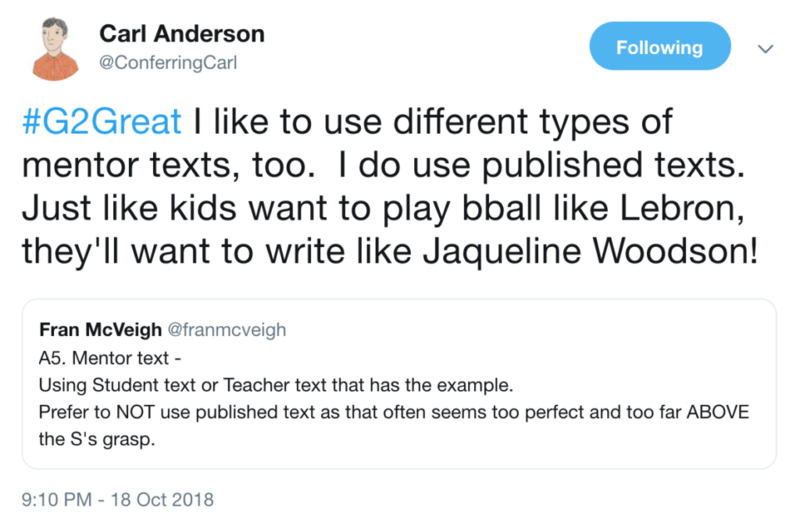 Here we are, two writers, having a really good conversation. 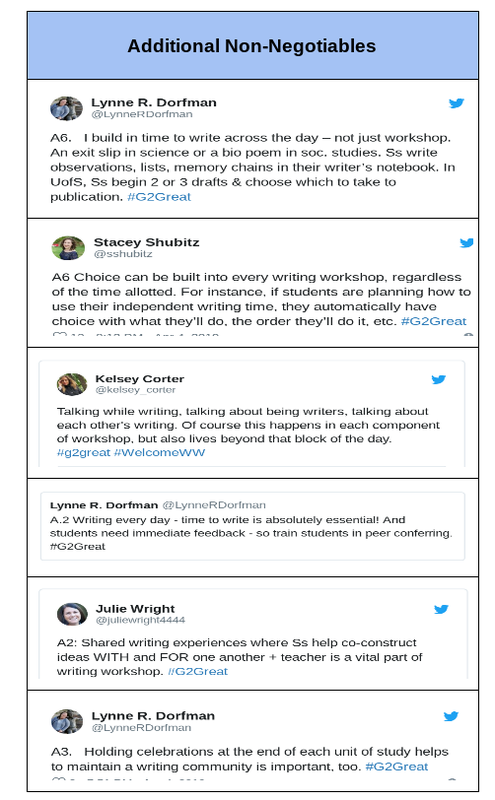 A writing conference is our way to help each other learn and experience all that writing brings with it. 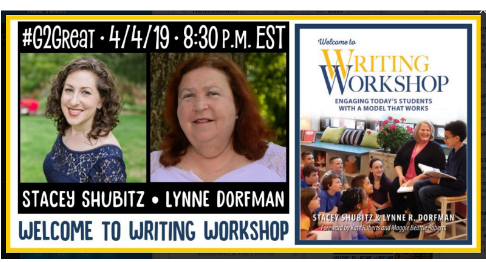 The thrill and power of a well-chosen word, the ability to capture a moment in time, or the opportunity to share and understand something new. Our one goal is to grow. Together, teacher and student sitting side-by-side the child is speaking and I am listening. 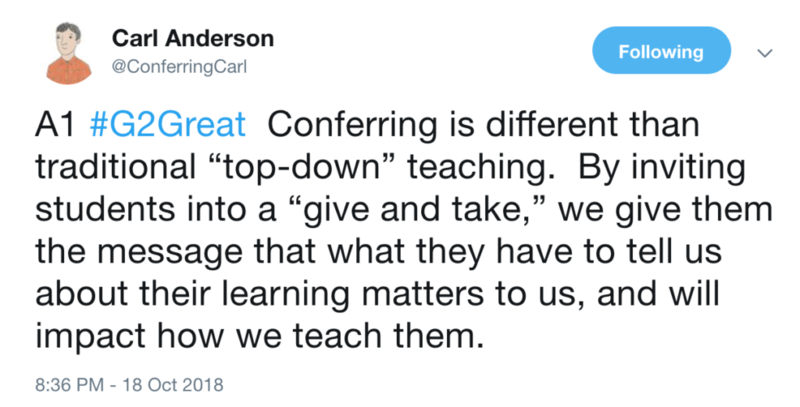 So, when I think of conferring, the word that comes to mind is essential. 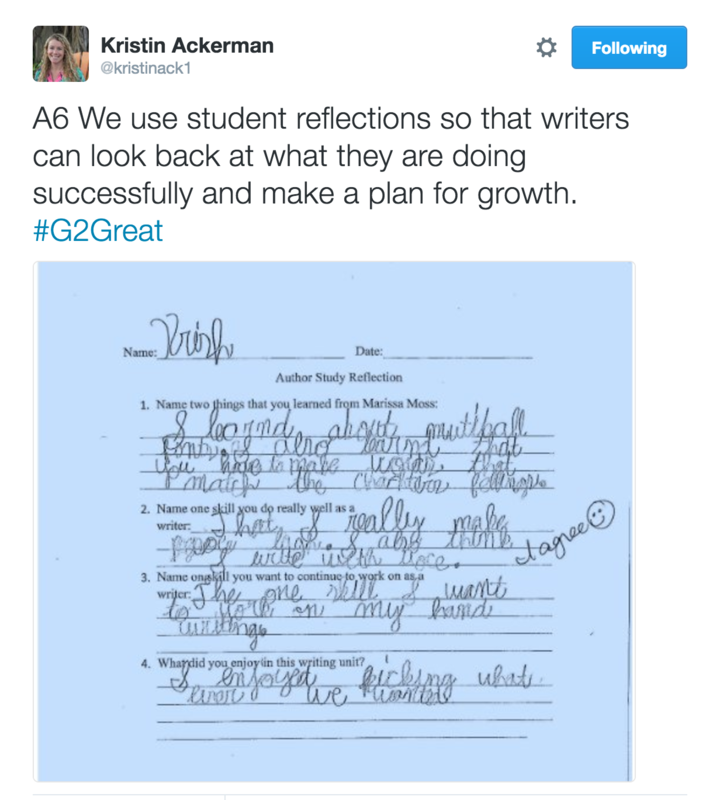 Young writers approximate their learning. 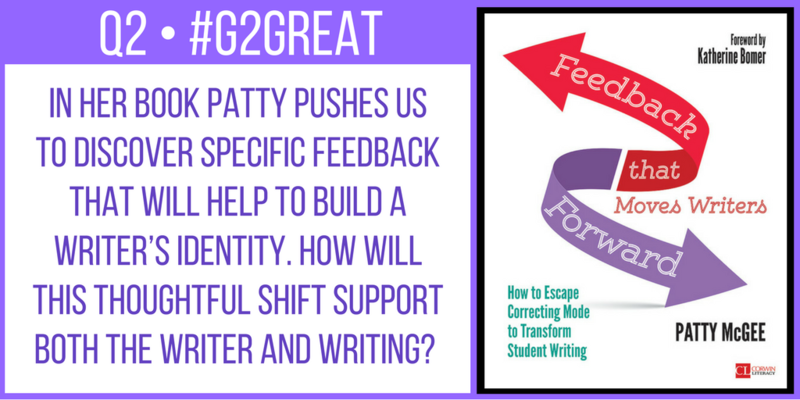 Every time we invite them to expand upon their thinking they begin to refine their process. 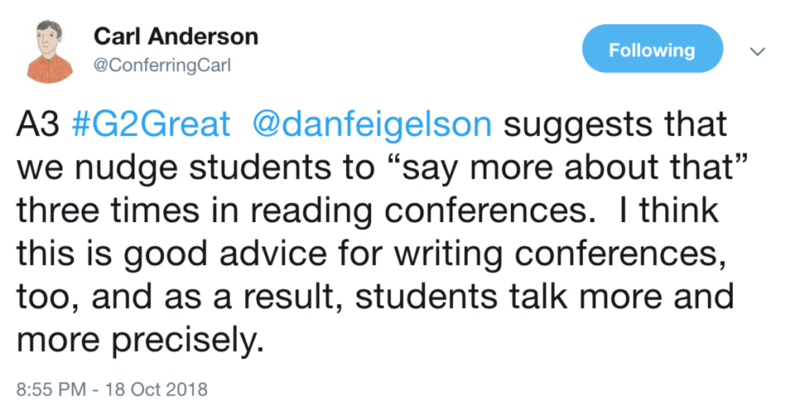 Talk is the way to cut a path to really knowing the writing process. 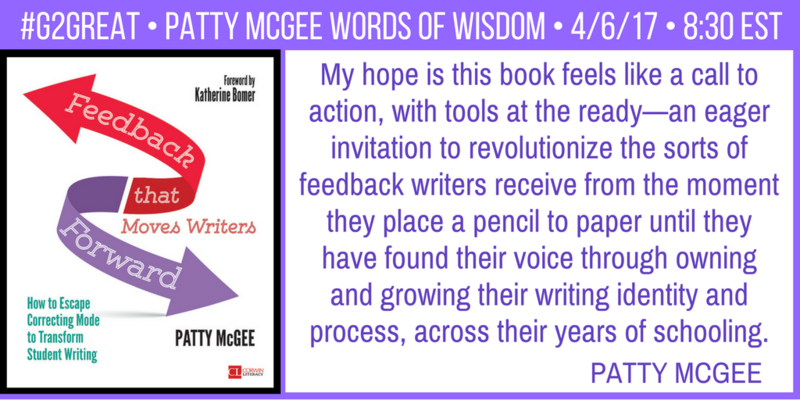 Writing gives a platform for genuine self-expression. 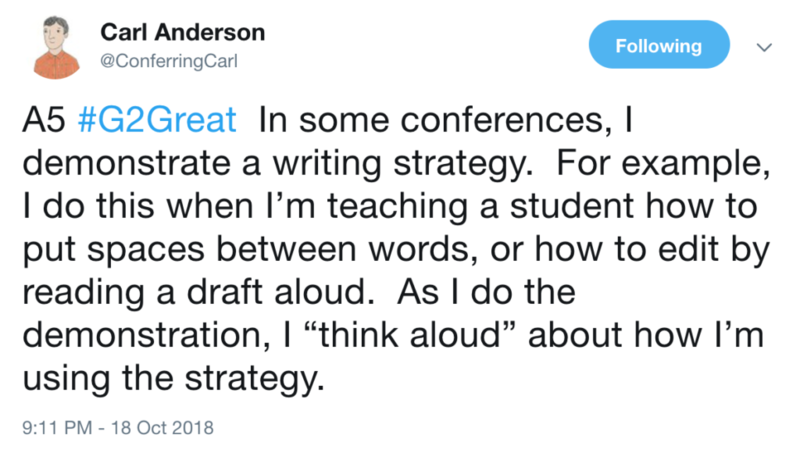 to think deeply, and build up meaningful experiences with spoken and written language. 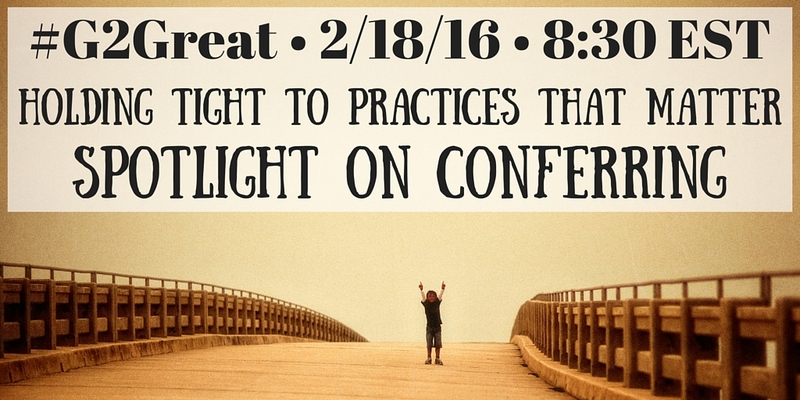 A conference asks us to lift our presuppositions. 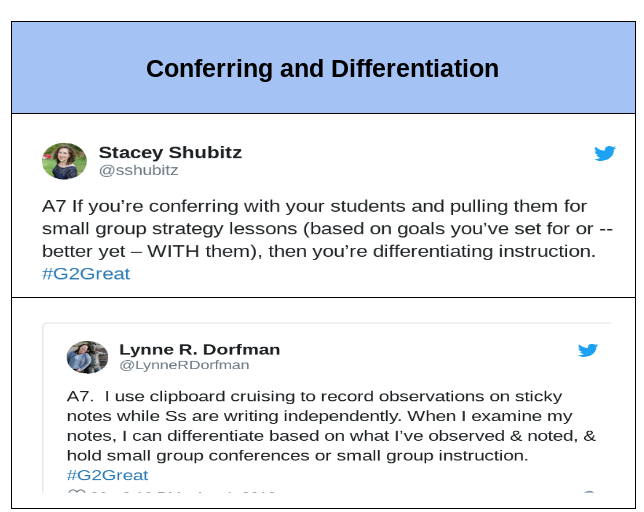 A conference is a formative assessment. 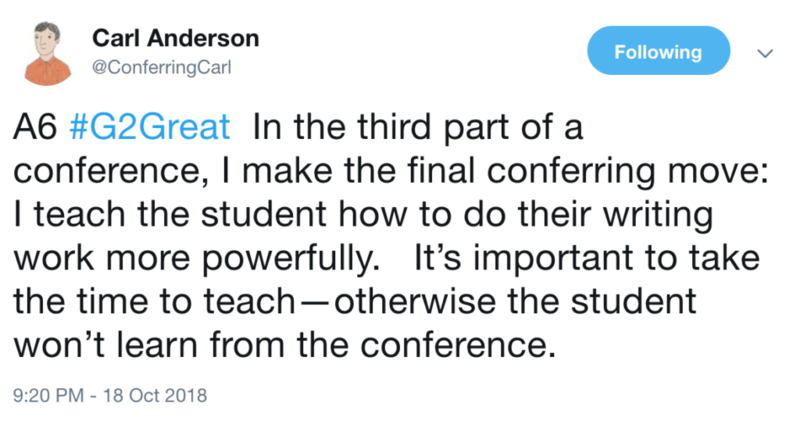 A conference is an opportunity to teach with gusto, and most of all with heart. It may not always be perfect but it will always be an attempt at grace. 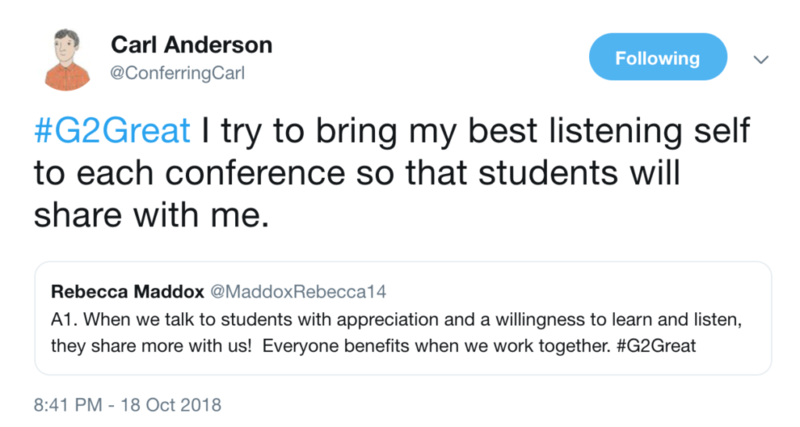 A conference is a live property, it is something unique every time because it is an extension of each student. 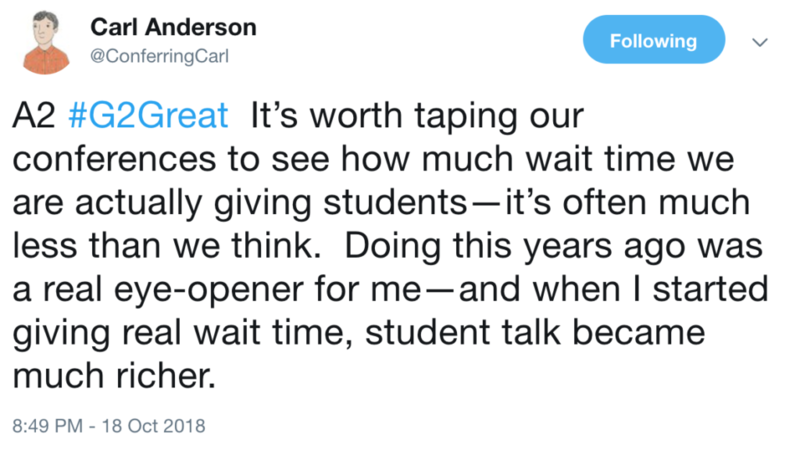 It is in the moment teaching that tells students that they are trusted because they are actively informing its process. 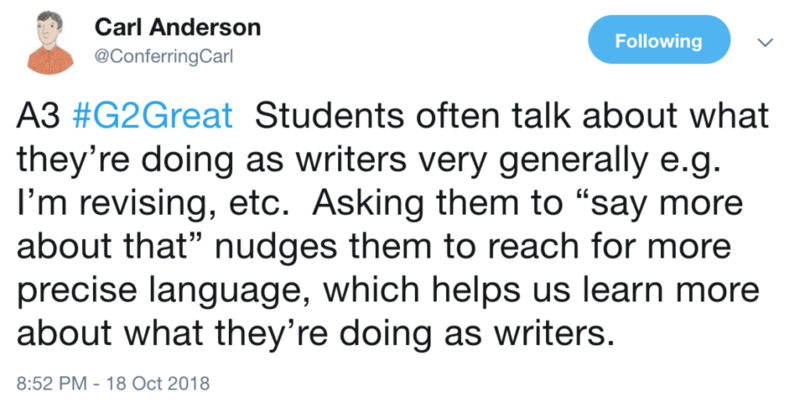 They inform the process with their words, their writing, and their values. 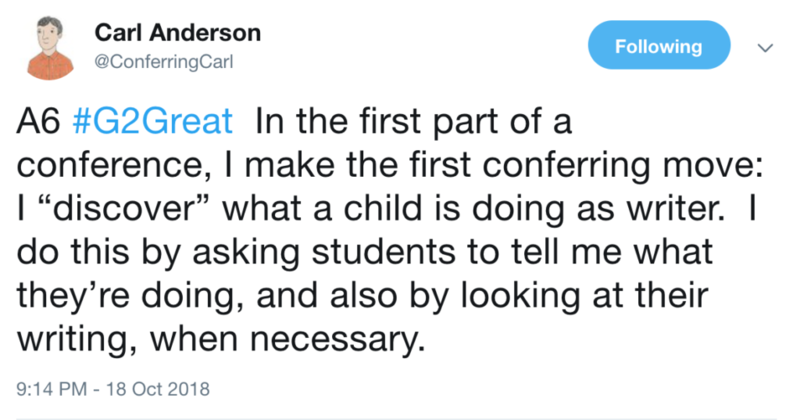 Yes, conferring is the work of a professional lifetime. 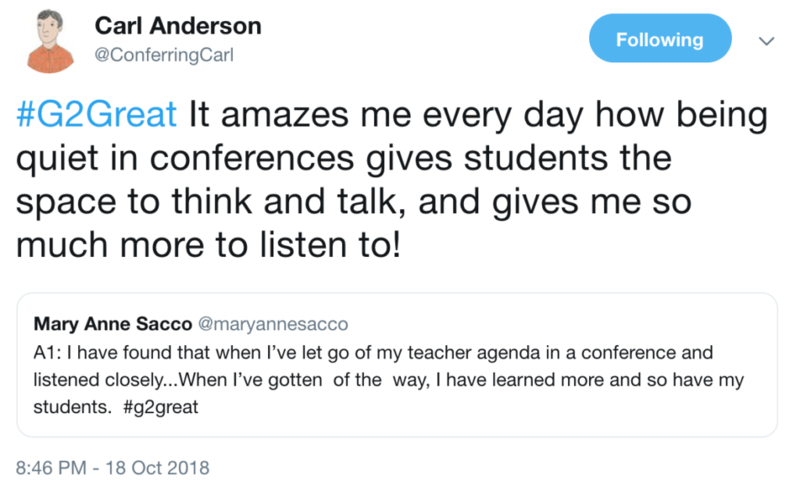 I know I will be striving to continue to grow as a teacher who can listen with with an open mind for the rest of my career. 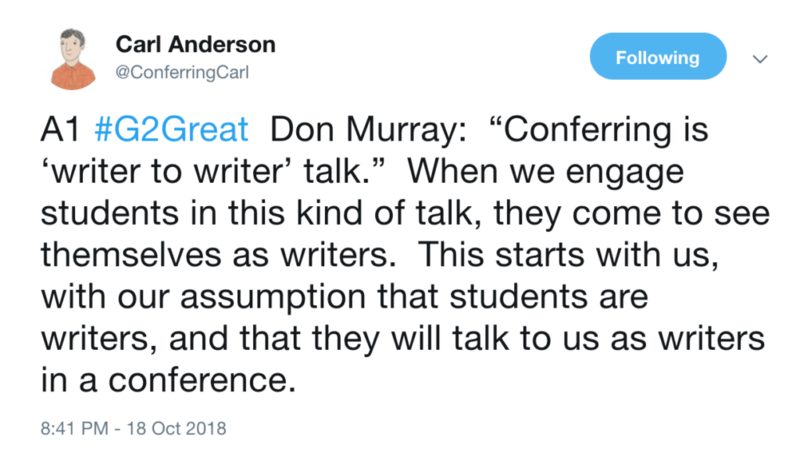 One who seeks to understand my students, and the writing process better one conference, one conversation, at a time. 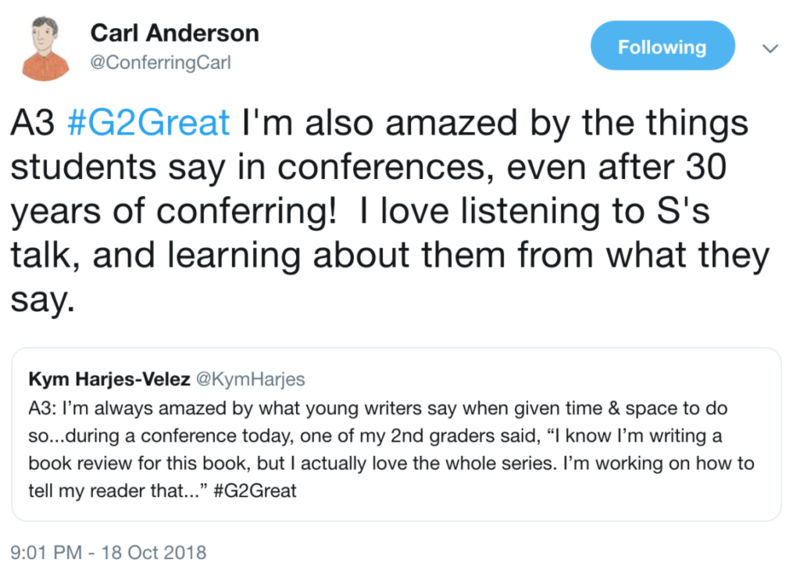 On October 5, 2017 #G2Great welcomed two of the greatest advocates for our youngest meaning makers. 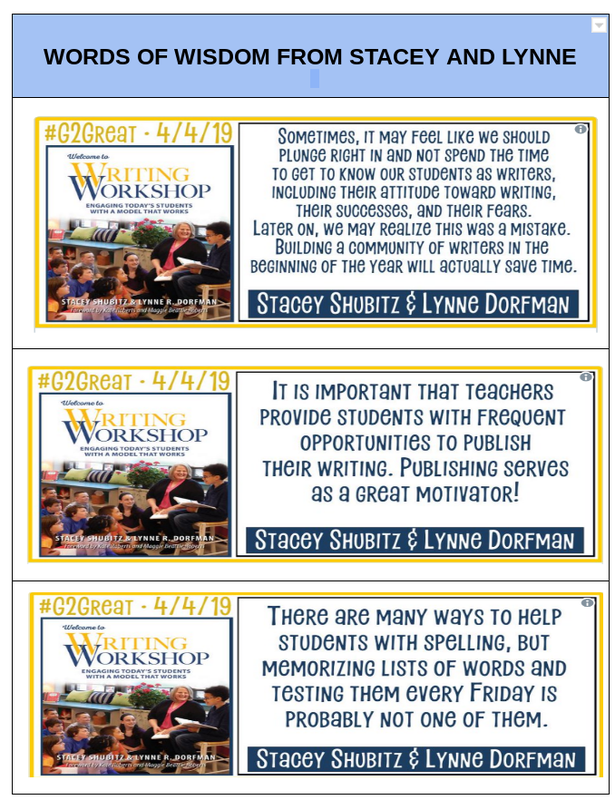 Kathy Collins and Matt Glover support our earliest readers in nurturing ways by promoting a healthy reading identity while thye develop a love for reading as they make meaning with texts they read, whether they read the words or make meaning through the pictures or their memory of a familiar read. 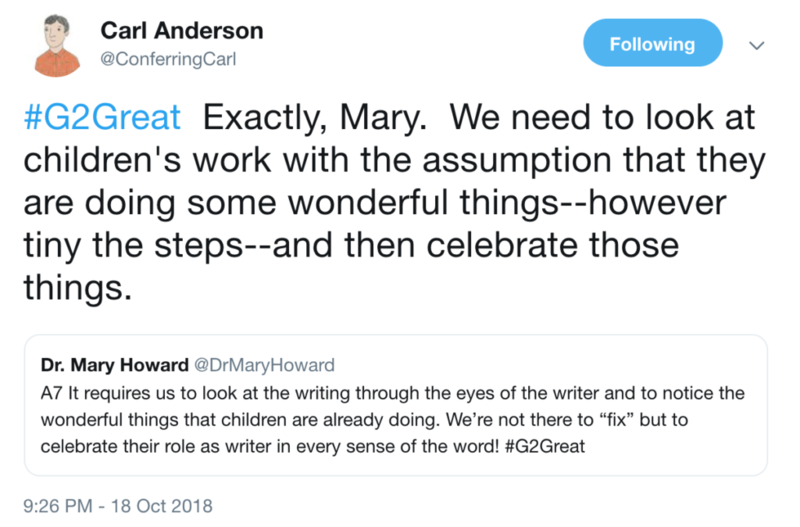 In their book, I Am Reading, Kathy and Matt open their introduction in part by sharing that their fascination wtih children’s thinking is what brought them together, which makes complete sense as Kathy came to the collaboration from a background of reading and Matt came from his experience with writing. 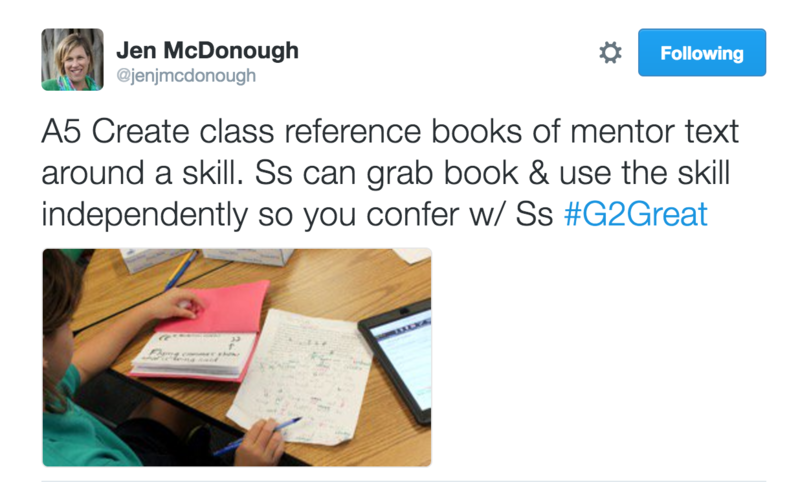 Reading and writing are really rooted in the thinking that comes before, during and after both reading and writing. 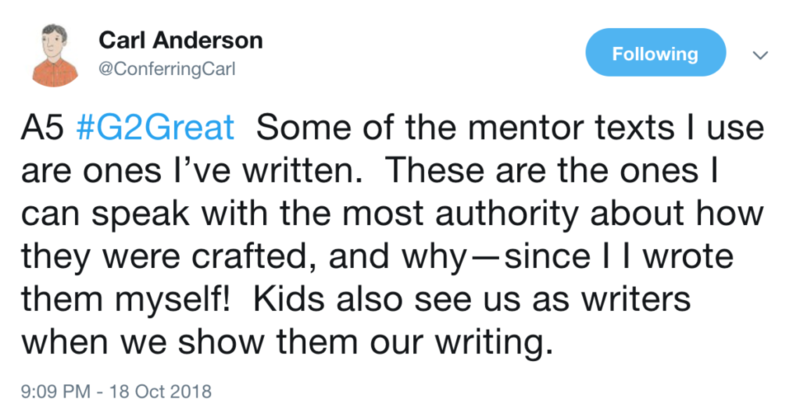 They are about making meaning. Children may be developing decoding skills as they advance through these levels, however they may lose the benefit of making meaning with texts and engaging in a playful sense with books that help to develop the thinking skills that children develop even before they can read conventionally. 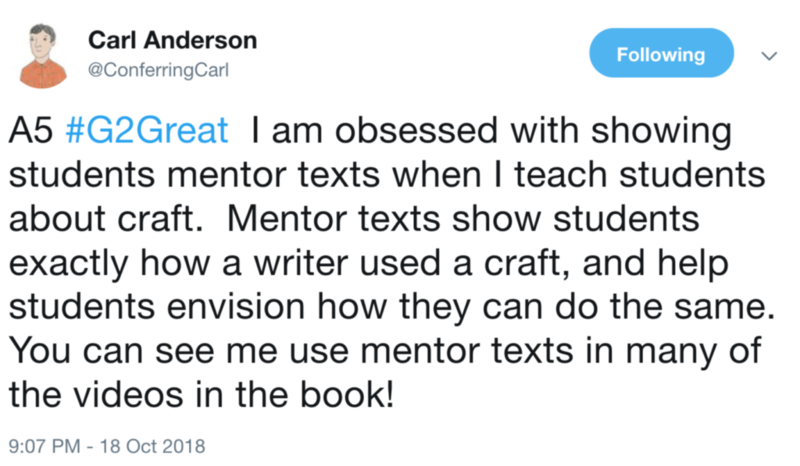 Reading identity begins to develop right away and if students are limited by choosing only just right books they begin to limit their own reading identity by these levels. 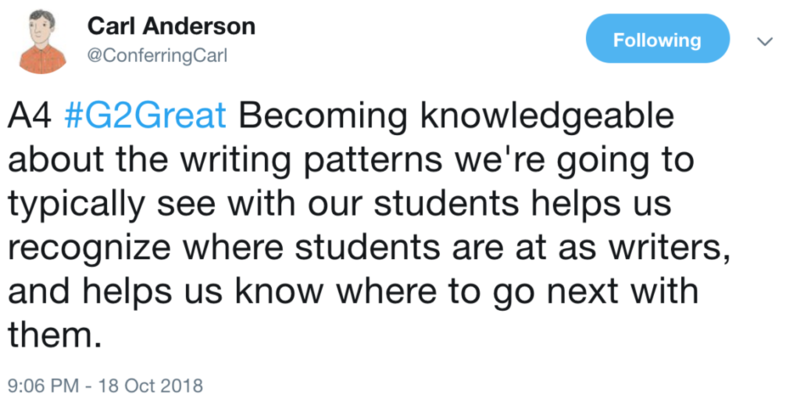 The rush to advance through levels further impacts reading as students lose opportunties to interact with texts in real ways where they are developing the thinking and talking work that develops comprehension and meaning making with texts. 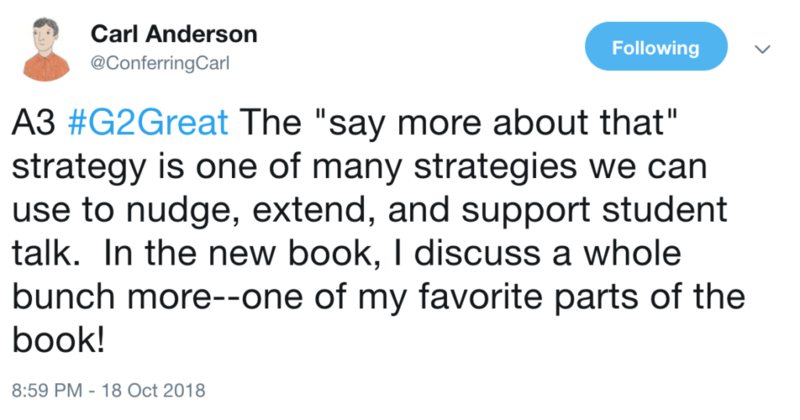 In addition to strategy use and thinking there are language benefits to both reading aloud familiar books and children reading familiar books. Just right books, familiar books, and unfamiliar books were just some of the topics we explored durring the chat. 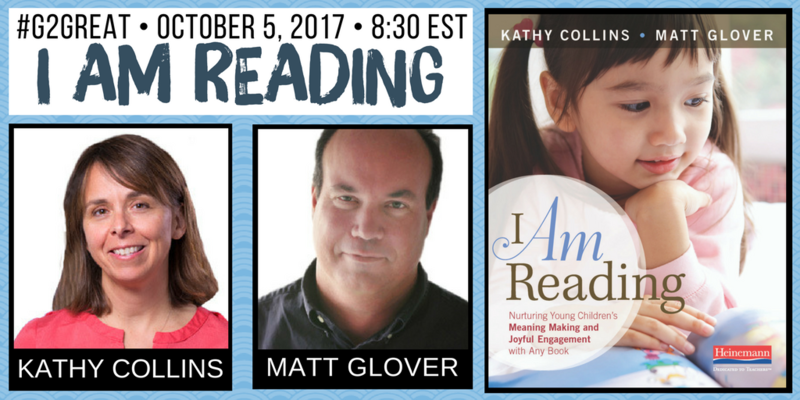 To learn more about supporting our earliest readers such as informational books and the value of conferring check out our #storify for the chat with Kathy Collins and Matt Glover. 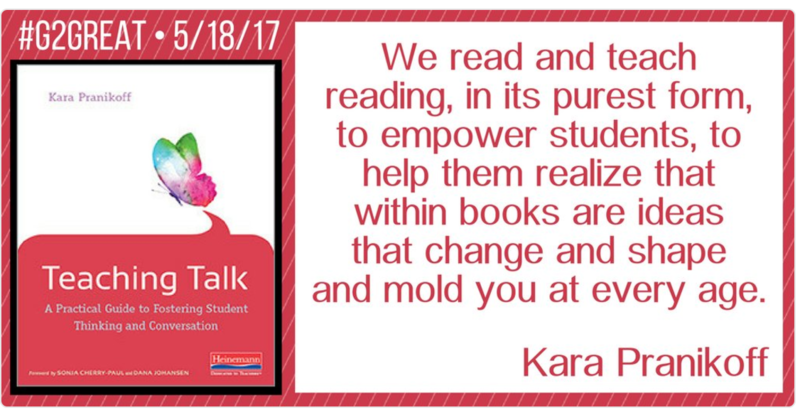 Their book, I Am Reading is a great source for anyone who reads with our earliest readers and wants to look deeper at ways to nuture early reading. 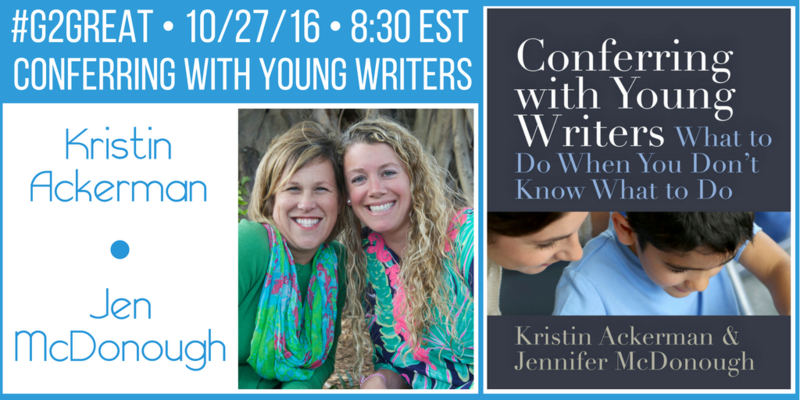 On October 27, 2016 #G2Great celebrated Kristin Ackerman and Jen McDonough’s beautiful new book, Conferring with Young Writers What to Do When You Don’t Know to Do. 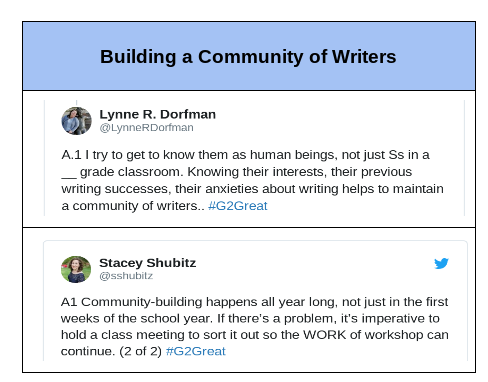 Kristin and Jen’s work brought us together to think deeply about what young writers need, and how to tap into conferring to encourage independence. 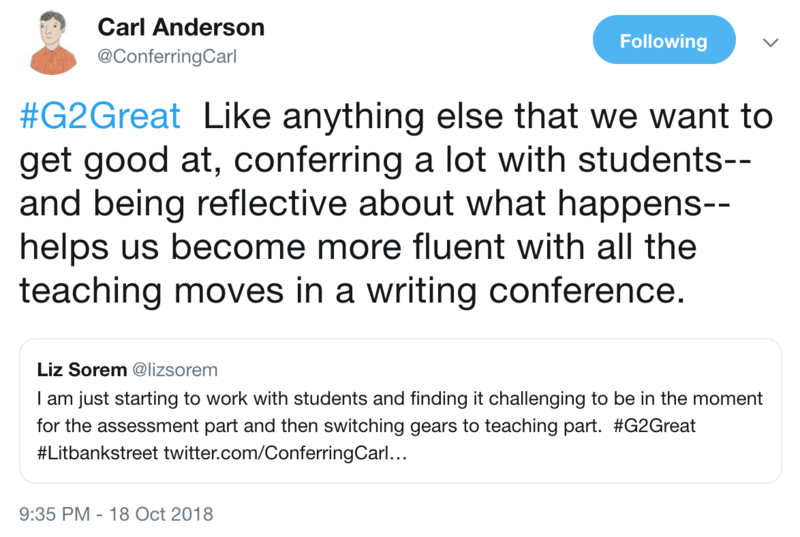 During the chat I imagined teachers everywhere thinking about conferring and the writing process as they dedicated more of their lives to the art of teaching. 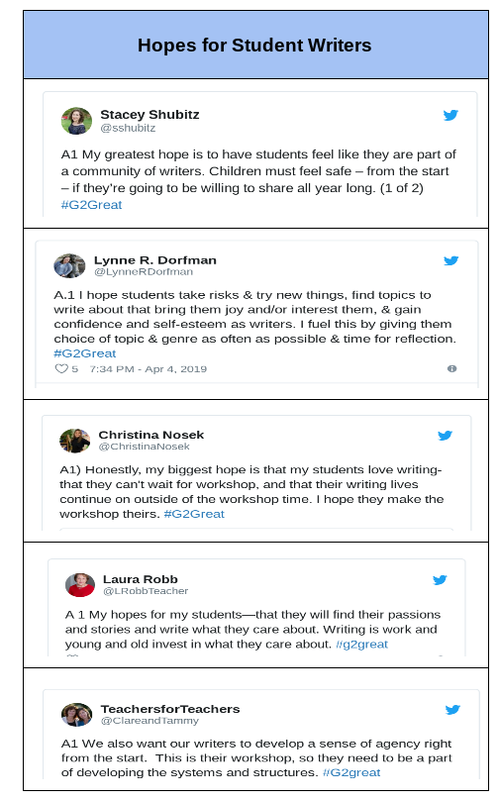 I am struck by an overwhelming sense of well-being as I think of all these literacy leaders who are pushing themselves to learn long after the school day has ended. 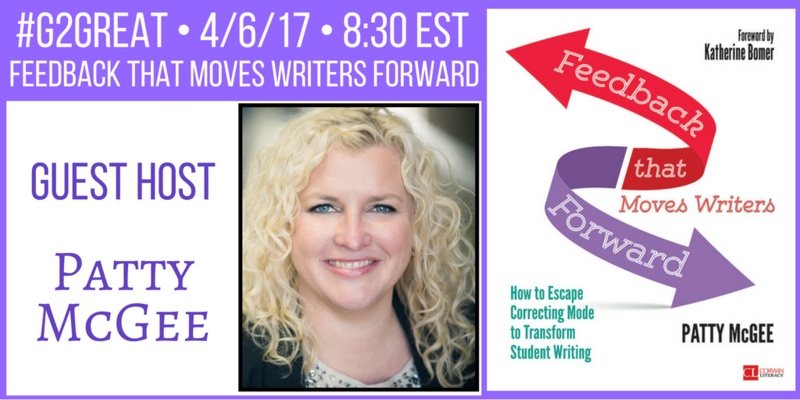 I truly believe that educators who actively read and write every day are a force for good in an otherwise challenging world. Thank you Kristin and Jen. 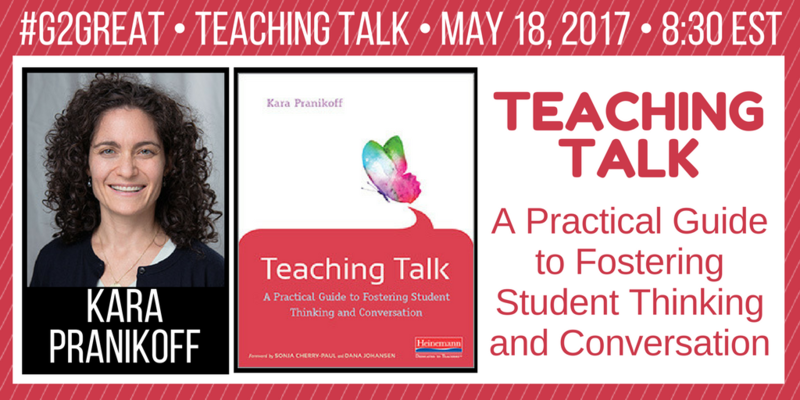 Your book really got the conversation going and made us all think of the power that skilled teachers can bring to conferring. 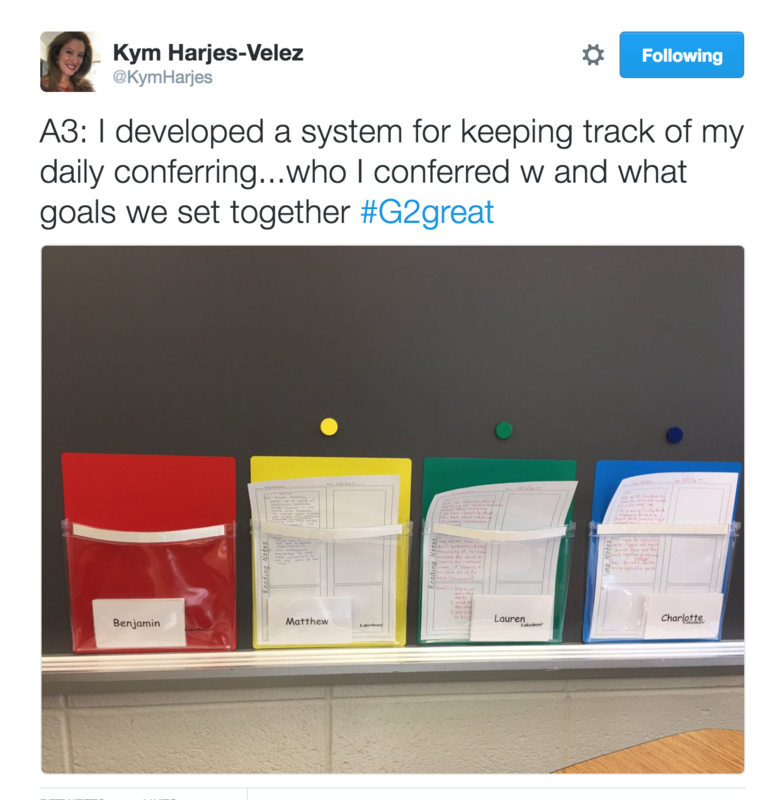 You reminded us that our conferring work builds community through strong relationships. 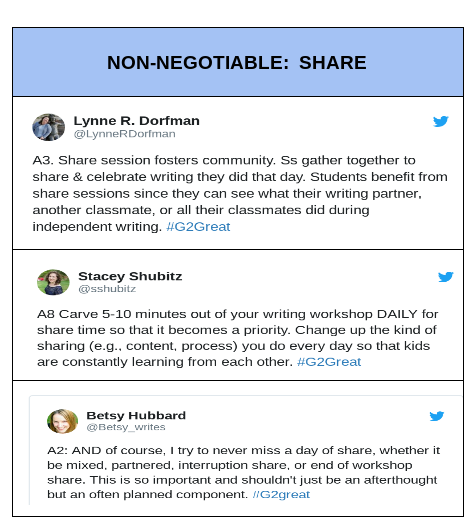 As I end this post I think about our growing #G2Great PLN. 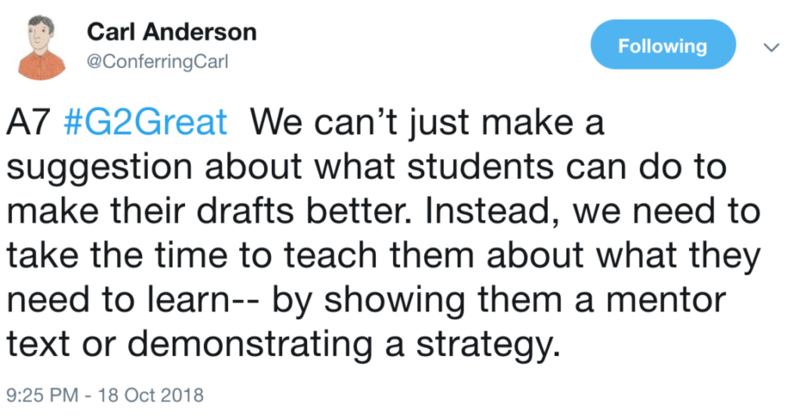 We are teachers, we are administrators, we are authors, and we are all dedicated to the art of teaching as we keep our students at the center of all that we do.